REVIEW: Jeanette Murray’s THE OFFICER AND THE SECRET: What Happens When Nothing Happens? Miss Bates thought Jeanette Murray’s The Officer and the Secret (#3 in the Semper Fi series) one of the most peculiarly non-plotted romance novels she’s read in a long time. Less-than-stellar romances tend to too much plot to mask weak characterization, lack of atmosphere, and rehashed themes. In the case of Murray’s Officer/Secret, the bare-plot consists of the everyday details of ordinary people ambling along, going to work, spending time with friends, and eating a lot of pizza and ice cream. Until the 80% mark of Miss Bates’s Kindle, the sheer niceness of it all made for one boring romance novel. Yet, in the final few chapters, she kinda found herself rooting for the hero and heroine and enjoying the book. Does that make up for poor Miss Bates being trapped in an episode of Friends for most of the novel? Here’s as close to a non-synopsis as Miss Bates will ever get. Recently deployed Marine, Capt. Dwayne (awful name) Robertson returns stateside, is reunited with good friends (Madison, Skye, Jeremy, and Tim who, Miss Bates gathered, starred in books #1 & 2), and re-acquaints himself with Veronica Gibson, one of their friends with whom he’d struck a Skype friendship. Dwayne and Veronica are attracted to each other and start a little dating dance which continues till 80% of the book has elapsed. Um, they hang with friends a lot; they attend Tim and Skye’s “re-commitment” ceremony. They watch movies; they work (she’s a waitress). Um, they do have one date, not sure where they’re going, but Veronica decides she’d rather eat pizza and watch a DVD on Dwayne’s big-screen TV … and here silly Miss Bates thought the romance genre was a female fantasy! Dwayne is obviously the “officer” in the title; but what of The Big Secret? It’s a tad confusing: is the secret Dwayne’s PTSD? It can’t be because he behaves like a mature adult and immediately tells his best friend and then promptly asks for counseling from the chaplain. Whew! This is great … great that Murray acknowledges the problem and points the way to recovery. One can only hope that all our veterans who suffer thus can experience this kind of resolution. But it doesn’t carry any conflict for the novel. Is the secret Veronica’s? Maybe. She was brought up by indifferent missionary parents, who carted her around the world while they saw to others’ salvation, all the while neglecting her. She never received an education and at 26 has to study for her GED. She is clueless … about pop culture and American slang, but she’s studying and learning so she can be normal! Because globalization hasn’t ensured that American culture permeates even the most remote of regions. Or, as Veronica says, “Coming from living in the jungles or barely populated areas of third world countries didn’t lend itself to modern American social practice. Nobody from the African Zulu tribe was going to ask her to the prom.” Gah. She reads magazines and watches TV and eats ice cream with her friends, Madison and Skye, while learning about pop cultural icons such as Lady Gaga. When we first meet Veronica, she’s dressed in baggy clothes and can’t bear a man’s touch. Miss Bates thought, oh no, sexual abuse, or assault? an eating disorder? … nope, wrong, just hasn’t studied enough fashion magazines. In this conflict-less romance, Dwayne and Veronica do eventually get it on, though she never tells him she’s a virgin, whereupon we read one of the most idyllic deflowering scenes ever written. (Really, if Woodiwiss could have made that Heather girl enjoy her “first time,” as much, there wouldn’t have been any flame to singe the flower.) They enjoy physical happy times … also watch sports and eat ice cream and pizza with the guys/gals. The friends are in and out of various apartments, giving advise, delivering pizza, tubs of ice cream, having heart-to-hearts that poor Miss Bates didn’t know who was who. This novel has a serious case of series-itis … and that pun is most definitely intended. And no conflict What So Ever. (Watch out! Possible spoilers ahead!) At most, in the last 20% of the novel, the hero and heroine have qualms about being together, largely due to the Other Woman, the oldest line in the book about the mhphmh breaking, and Veronica’s ignorance about basic human biology. Oh, there’s also a bad burrito … but Miss Bates has already neared spoiler territory. Nuff said. What did endear this novel to Miss Bates? Well, the hero is a real sweetheart. The heroine is, unfortunately, a bit of a nincompoop, but she does have a sense of humour. They both do. They’re also loveably clumsy: pizza bits fly on cheeks, they trip, sprain ankles; they’re adorably goofy, both of them. They’re really quite strong people, which is what makes their socalled issues such non-issues, which makes for the flat narrative. It’s nice to read about reasonable people making their steady way to an HEA. And, unlike Miss Bates’s previous read, the ethos of this novel is quite amenable to her (except for the crack about the developing world): even though you’re a big brawny guy in uniform, you recognize when you need help and seek it; even though life has thrown you lemon-parents, you pick yourself up by the bootstraps, even when your brain-wattage is on the low side, and make the best of life’s lemonade. You love and support your friends. You don’t let past bitterness, regret, and disappointment poison your present or your future. You take responsibility for your actions. You make amends. You say, “I love you” and mean it. It’s a nice read, but it really really lacks tension. If you like your romance novels angst-ridden, this isn’t where you’re going to find it. Jeanette Murray’s The Officer and the Secret is available on July 2nd. It’s published by Sourcebooks. Miss Bates received a generous e-ARC from Sourcebooks via Netgalley in exchange for this honest review. Allie Pleiter’s Homefront Hero is a gem. Pleiter wields the strict parameters of the category and inspirational romance like a sonnet in the hands of the Bard. If inspies aren’t your thing, this lovely little book may change your mind. This is one of the best romance novels I’ve read in a sea of uninspired ones! What does Pleiter accomplish? Because this is an accomplished book. She depicts established and burgeoning faith as something living, breathing, elemental, and essential to a full life. She does so without preaching, only weaving her characters’ faith effortlessly into the narrative in a believable and moving way. In her hero and heroine, she creates two loveable, sympathetic, and flawed individuals. She makes history come alive with detail and atmosphere without over-riding the plot or the romance. She makes wonderful use of a central, unifying metaphor. Her romance is a fully fleshed romance as well as an allegory of death and resurrection of body and soul. Some of the writing is simply superb. There is banter, delightful dialogue between the two leads and secondary characters with “character,” not just functionality. The story is set in the midst of America’s involvement in the Great War, at Camp Jackson in S. Carolina. 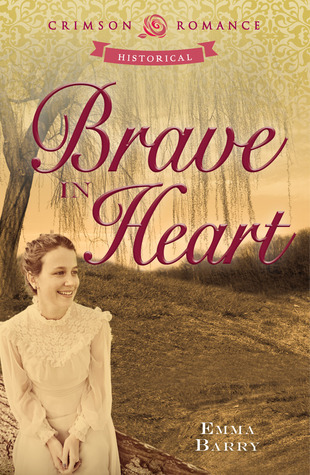 A wounded, recovering war hero, John Gallows, and a neophyte nurse, Leanne Sample, meet when General Barnes orders him to assist with her project. He has been the driving attraction of an army recruitment campaign; he’s handsome, cavalier, charming, wealthy … and wants only to return to battle. Leanne is also on a mission to convince men and boys to join women in knitting socks for the troops. What better poster boy than John Gallows? John uses his acquiescence as a bargaining chip with General Barnes to return to the front, even though his leg is not, nor ever will be, healed and he is in constant pain. What follows is a wonderful, humorous undermining of an alpha male as he learns to knit at the hands of this beautiful, intelligent, pious, and sharp-tongued young woman who takes a stand against his charm. What starts as a gentle inspie romance soon grows into a dark night of the soul. John grapples with feelings of self-hatred and worthlessness, declaring himself “an unfinished hero,” even while his feelings for Leanne and her gentle persuasion towards God have him in knots. Once the hero’s and heroine’s feelings are fully engaged, John’s imminent departure, his need to be worthy of his heroic status, brings the first of the dark moments for this couple: separation, possible death. But death comes in another form and John cannot abandon Leanne to it. The Spanish influenza epidemic strikes; John and Leanne are plunged into a dark night of the soul. But it is always darkest before the dawn and this novel concludes with stirring scenes of redemption and rebirth. It also has the best “baby” epilogue I’ve ever read … with nary a baby in sight. Homefront Hero is a story, to quote the hero, of “love and God,” of redemption and hope, of humour and everyday life and heroism. It is not insipid, naïve, or simplistic, which are the adjectives we can sometimes lay at the feet of inspirational romance.